I’m passionate in continuing education and in becoming a better leader. I wish to take my education and professional experience into a new company. The most effective leaders share certain qualities: exceptional communication skills, a strategic outlook, strong ethical convictions, emotional intelligence, and passion. It’s how they lead that differs. 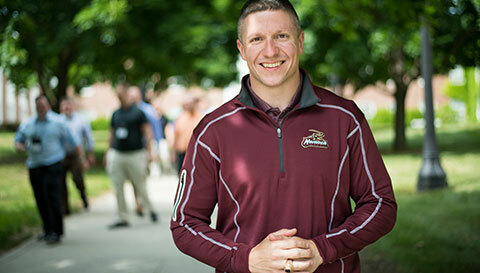 Norwich University’s Master of Science in Leadership helps a wide range of professionals develop their leadership styles and the skills to lead and inspire positive change in their organizations. Norwich University has a long history of leadership with graduates that have been central to some of the greatest military, social, and business decisions of the past 200 years. Now it’s your turn to join our tradition of leadership. Learn from a faculty of expert senior and mid-level leaders. Build your leadership development portfolio around your career goals and track your progress as you prompt change and growth in your life and work. Network and develop professional relationships with a diverse group of students. Engage in a curriculum that combines contemporary business theory with workplace application for immediate results. 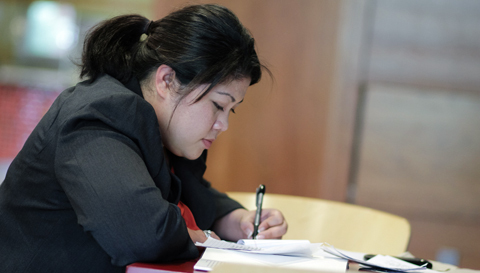 Develop a greater understanding of a range of perspectives about leadership. Apply to one of four start dates. Help us learn more about your experience and see if you qualify for the Master of Science in Leadership program. Norwich’s online Master of Science in Leadership program is comprised of six courses, each of which is 11 weeks in length for a total of 36 credit hours. Students master one course at a time, to create a strong foundation of knowledge and context for future topics. Develop a strong foundation of leadership through ethics, strategic communication, and a personalized management style. Manage organizational change and problem-solving at the highest level. Demonstrate a clear perspective on leadership strategies, management theories, and contemporary business issues. Apply classroom lessons within the workplace immediately. Present a completed leadership development portfolio — a toolbox of leadership concepts and personal reflections that will help you adapt your personal leadership style through your career. Students will complete the following three courses prior to choosing a concentration. This course focuses on differentiating the conceptual and theoretical aspects and models of leadership and leadership studies to enable you to apply leadership skills and principles to your workplace. The fundamentals of leadership are taught within the context of present and past leaders, with an emphasis on how to practice these fundamentals in an ethical manner. This course provides information about evaluating emotional intelligence, or EQ. You will be given the tools and the opportunity to evaluate your capacity to think about work through the lens of reflection and introspection as a guide to understanding the behavioral aspects of working together and providing customer service. By examining thinking patterns, you will gain new skills in developing intuitive reasoning that will enhance your professional interpersonal relationships with peers and customers. A leader’s ability to understand and follow the change management process in a collaborative manner is a vital skill to master. This course focuses on the strategic leadership of change in organizations. You will learn about change from a leadership as well as a management perspective in organizations, both national and multinational. This broad-based course differentiates the conceptual and theoretical change models in order to assist the student in understanding the best ways to lead and manage change. You will learn the importance of understanding and following the change management process in a collaborative manner. The course helps students learn about and practice leadership skills that foster positive changes in people and organizations. Examine key leadership concepts, such as organizational behavior, change management, and emotional intelligence through a multidisciplinary framework. Strategic communication is a vital skill in today's demanding, fast-paced, virtual or global workplaces. In this course, you will identify your personal leadership style, your tendencies and preferences as a professional, and how you assimilate and apply information. Experiential learning is a large component of this course. You will practice your skills at work and report your experiences through your Leadership Development Portfolio (LDP) and, as in all courses, learn from your peers in classroom discussions. This course focuses on strategic organizational behavior in organizations. You will learn about the importance of strategic alignment in order to enable effective organizational behavior. Systems thinking and organizational behavior provide a framework that you can use both to analyze and influence the behavior of individuals and groups within the organization. This broad-based course analyzes and applies various holistic strategic organizational behavior models in order to assist you in understanding the best ways to assess and impact the strategic alignment of organizations. You will also learn the importance of a leader’s ability to understand and use various organizational behavior and organizational strategy models. You will apply principles of leading change, strategic organizational behavior, and strategic leadership to people and organizations to impact performance and ensure future success. This course develops an understanding of the implications of strategic alignment and organizational learning to the organization’s success. It differentiates conceptual and theoretical change models to assist students in understanding the best ways to lead change and foster a learning organization while considering individual and group behavior as tied to strategy. The course demonstrates how strategic leadership, organizational behavior, and change theories are applied in a collaborative manner and will lead to aligning stakeholder’s interest. Develop the skills you need to engage stakeholders, respond to today’s issues, and shape culture. This course addresses the dynamic economic, social, and cultural transformations faced by contemporary leaders in the public sector, government, and military organizations as they strengthen agencies for tomorrow’s challenges. Part of these challenges comes from the need to cope with new forms of competition, market demands, technological innovations, and global economic and terrain shifts. Combining the latest leadership theories with the most effective lessons from the private sector, students will gain theoretical frameworks and practical tools to help effectively improve and enhance their skills to manage complex systems, influence organizational context, engage stakeholders, and shape institutional culture. The topics covered include: history and theories of successful public sector/government/military management, contemporary leadership strategies, and innovative responses to public sector challenges in a growing global marketplace. This course answers one of the main challenges of the 21st century: ensuring the readiness of public, government, and military organizations to answer complex, contemporary global challenges. As budget cuts and funding reductions continue for many public organizations, leadership is charged with finding economical ways to increase the value of services and products by streamlining processes and integrating efforts at macro and micro levels. This course addresses challenges faced by public sector/government/military leadership in developing collaborative relationships spanning across agency borders. Through understanding how to manage adaptation to changing environments and successfully dealing with multi-faceted variables using planning and control strategies, students will learn new approaches to leading people. Emphasis is placed on implementing fundamentals of strategic and performance management by leading effective change initiatives within an organization, and fostering teamwork by creating a work culture that values collaboration. Topics covered include: creating operational synergy, and leading internal and external stakeholder relationships to promote information sharing and create collaborative partnerships. This course in capstone studies provides students the opportunity to synthesize learning from all previous courses and to apply the concepts and principles in two ways: the preparation of a written capstone project that offers a practical or theoretical solution to an organizational challenge or issue of contemporary importance and relevance to the work or career goals of each student; and a 1500-word paper suitable for publication in a professional journal. Students will be required to exhibit in-depth critical thinking, organizational analysis, and effective writing. Course assignments will maximize the exchange of student suggestions and comments on the various stages of the capstone project, to include but not limited to topic section, thesis, resources, and supporting information. Prerequisites: Completion of all prior required core and concentration courses, or permission of the program director. Learn the skills and strategies necessary to enact real change in your organization as a human resource leader. Explore the impact of globalization, technology, and diversity in the workplace. This course addresses the history and evolution of human resources leadership, along with current trends and future needs regarding various leadership strategies that are utilized within a broad range of organizations. You will examine the impact that factors such as globalization, technology, and worker diversity have on achieving the work/life balance needs and capabilities required by organizations and individuals. You will also explore the role of the leader in developing a value-based organizational culture capable of achieving strategic goals and objectives. Through the discussion and understanding of human resource leadership principles and personal reflection and integration, you will gain the ability to help design, develop, and construct strategies at an executive level while concurrently helping employees grow and develop as individuals. This course focuses on the various management systems and best practices utilized within an organization to leverage human capacity to achieve strategic goals. The coursework will help you increase your knowledge of workforce development and retention strategies, through studying topics such as rewards and recognition, motivation and productivity, training and development, cultural awareness, and achieving customer excellence through teamwork and collaborative improvisation. Additionally, you will study how maximized utilization of human capital has become the centerpiece for success in an increasingly complex world, and how human resource leaders must confront ambitious goals while balancing a volatile economic market, environmental and legal risks, advancements in technology, and workforce needs that are all evolving at an increasingly rapid pace. You will also explore various measurement tools designed to help assess the efficiency and effectiveness of management systems employed and analyze methods for developing a blueprint for executing strategic objectives. Study effective change management strategies, modern initiatives, and how to analyze successful or failing practices within your organization. To paraphrase Jack Welch from his book, Straight from the Gut, if the rate of change outside your organization is greater than the rate of change inside your organization, the end is in sight. In order to remain competitive, companies are continually changing and evolving in myriad ways. This course is focused on helping students develop the tips, tools, and techniques to be a successful consultant on change management. You will examine models for implementing change initiatives, learn how the models can be adapted for various circumstances and situations, evaluate the key attributes of successful consultants, and analyze personal strengths and weaknesses for being a consultant. Organizations of all types are clamoring for employees or consultants with the expertise to lead the implementation of change initiatives. As such, this course aims to provide students with the opportunity to develop the skills necessary to help others make an immediate impact in their organizations. Throughout the course, emphasis is placed on practical application of implementing change initiatives. You will analyze and synthesize information from real-world case studies of successful and unsuccessful change initiatives to determine what worked and what did not work. The final academic requirement for the leadership program is a residency at the beautiful and historic Norwich University campus in Vermont. Students have the opportunity to meet with fellow students, faculty, and program staff in both formal classroom and informal settings. Academic recognition ceremonies and commencement cap off the week, and family and friends are encouraged to attend. The Master of Science in Leadership program is an investment in your future that we can help you manage from a financial perspective. There are many ways to get financial assistance and many strategies that can help you achieve your goals. Whatever your individual situation, we can guide you through the financial planning process. Our degree can help you advance in your current role, move into higher-level leadership positions, and even increase your earning potential. In fact, the average management professional in 2016 earned $100,790, while the average top executive earned more than $100,000 (U.S. Bureau of Labor Statistics). 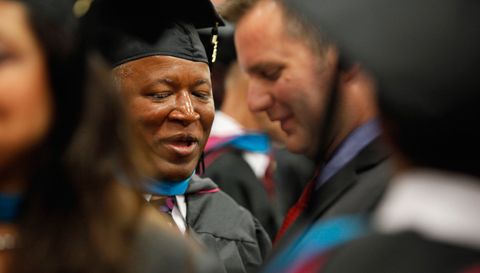 Read more about our Master of Science in Leadership student outcomes. *Source: Norwich University Master of Science in Leadership Graduate Survey, fielded March 2016. Alumnus named an FBI Special Agent in Memphis. If your focus is on getting results through people, you are in the right place. Our online program gives you the opportunity to interact and learn from a faculty of business managers and entrepreneurs, all of whom bring significant value directly from real-world experience. Rex Marks is the Program Director and a faculty member in Norwich’s Master of Science in Leadership program and Director of Norwich's Leadership & Change Institute. He specializes in leadership development and team building, problem-solving, project/fiscal management, emergency management, and organizational development. He has over 28 years’ experience as an accomplished and professional law enforcement leader. He earned his master’s degree in organizational leadership and a certificate in teaching and learning from Norwich University. He also holds an MPA with a concentration in disaster management from American Military University. He is currently completing his doctoral degree in public policy administration with a concentration in leadership, community sustainability, and terrorism with Walden University. Get to know the graduates of Norwich’s online Master of Science in Leadership program. I chose Norwich because of its distinguished history, its credibility as a legitimate institution of higher learning, and because it had the programs of greatest interest to me. I enjoyed the diversity of backgrounds of both my professors and fellow students, which allowed me to really expand my breadth of understanding outside of the military. I believe that going back to school and choosing Norwich has allowed me to demonstrate the importance of lifelong learning to my children. What courses can I take in the leadership program? Students take six courses that cover a wide range of topics and provide them insight into their own leadership style and emotional intelligence quotient. Other course topics include leadership fundamentals, strategic communication, leading change, strategic organizational behavior, and developing a learning organization. Students can choose from one of four concentrations: organizational leadership, public sector/government/military leadership, human resources leadership, or leading change management consulting. How long is the leadership program? Master of Science in Leadership alumni have found employment in a variety of public, private, and government organizations, including Capital One, Cargill, Caterpillar Inc, Omnicell, Toyota, the U.S. Department of Homeland Security, and numerous branches of the U.S. military. Many alumni now own their own consulting firms. How are Master of Science in Leadership faculty members selected? All organizational leadership program faculty members have advanced degrees (most are terminal) and are subject matter experts in leadership. They represent a wide variety of academic disciplines including: public administration, justice administration, philosophy, public affairs, criminology, education, law, and human services. They must demonstrate a wide range of university/college-level teaching experience and a history of leadership in academia, the private sector or the public sector. Neither the GRE nor GMAT is required to apply, but may be requested if an applicant's undergraduate GPA is below 2.75. How much is the online Master of Science in Leadership degree program? When you apply for admission to the leadership program, you can submit transcripts and course outlines from previously attended institutions of higher education to be considered for transfer credits. Transfer credits will be evaluated on a case-by-case basis and may be accepted for up to 12 credits. Norwich complies with VA regulations and guidelines as they pertain to transfer credits. Through an agreement between Norwich University and the Department of the Army/U.S. Army Command and General Staff College, up to six credit hours will be awarded toward the degree for OL550 Strategic Organizational Behavior.